Threatening animals’ lives for the purpose of “entertainment” is unacceptable. Fortunately for these two birds – tastelessly named “Sage” and “Onion” – the radio poll was soon overwhelmed by thousands of people, including Brian May, who voted for a better outcome for the turkeys. Two turkeys’ fates hung in the balance this week, after a tacky and irresponsible publicity stunt by Oxford radio station JACK fm asked listeners to vote on whether to “keep it” or “cook it” in an online poll. TThreatening animals’ lives for the purpose of “entertainment” is unacceptable. 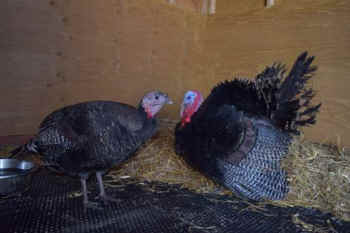 Fortunately for these two birds – tastelessly named “Sage” and “Onion” – the poll was soon overwhelmed by thousands of people, including Brian May, who voted for a better outcome for the turkeys. Today, we stepped in to help ensure that they will indeed be given the safe, permanent home that they deserve. The turkeys have just arrived at Hopefield Animals Sanctuary in Brentwood, Essex, which is supported by lovely vegan singer Leona Lewis. “Christmas is a time of goodwill, and I’m glad that sentiment has been extended to these two turkeys”, Leona says. 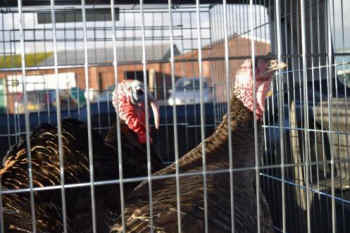 In honour of their celebrity benefactors, the two turkeys will be renamed Brian and Leona! In nature, turkeys are protective and loving parents as well as spirited explorers who can climb trees and run as fast as 40 kilometres per hour. Turkeys in the wild can live up to 10 years, but those in the meat industry are normally slaughtered between 12 and 26 weeks of age. The young birds are hung from metal shackles attached to their feet and dragged through an electrified bath that can cause them to have full-body tremors. Sometimes the turkeys are still conscious when their throats are slit and they’re placed into a bath of scalding-hot water that’s used to remove their feathers. You can also save turkeys this year by leaving them off your dinner plate and celebrating a merry veggie Christmas! Check out our guide to a plant-based Christmas dinner for ideas and recipes.